A version of this essay appeared in Vitamin PH: New Perspectives in Photography (Phaidon, 2006). A rumour about the landscape of New York City: the major avenues recreate the topography of the South West—the deep canyons, the stone walls of russet, ginger, grey. As the story goes, the exploration of the America West was contemporaneous with the rising buildings of the city—the architects and the populace recreated the Western dream of a vast frontier. Just around the next corner, at the end of Broadway, there is freedom. Now, the West is a grid of highways, underground cables, dams.... The latest frontier, the internet, has also succumbed to civilization; monthly bills are collected. Where painters of the Hudson River school captured the notion of an American promised land, and Ansel Adams looked at a majestic, if endangered, national identity, Tim Davis is the cartographer of the American corpse. This is the United States that Robert Crumb backdrops with a crisscrossing of telephone poles, fuse boxes, and an inexhaustible array of urban warts. But death is beautiful. Whether it is Caravaggio giving us his Judith and Holophernes, Matthew Brady on a Civil War battlefield, or Cindy Sherman posing the slayed hand of a murder victim, the human impulse is not only to flinch in horror, but to revere. We cannot escape our predator/scavenger nature—we revel in death. Tim Davis, with cruel precision, documents the beauty of our dying environment. Searchlights (from the series “Illiluminations” ) captures an intersection of slushy snow, post-war houses, trees, and a myriad of overhead cables. 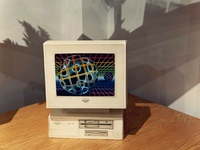 Box Props (from the same series) portrays the forlorn visage of a ragged computer with a psychedelic screen graphic. In his series, “My Life in Politics” (2004), Davis extended his argument to the arena of politics, with such evidence as Oval “Office”. We live in a lifeless world, engineered[? Or powered?] by a lifeless democracy. We prefer the coffin; it’s neater. With inclusive acuity, Davis examines the terrain—physical and psychological—that we have manifested. The sultry colours and surfaces of “Illiluminations” are indicative of the cultural seductions that take place, even if we don’t understand them. Why would we be enticed by a huge toy tiger (White Tiger )? Why are the melted light bulbs so irresistible (Bad bulbs )? In this artificial garden of our own creation—shopping malls and potato chip bags—we are perfectly blind to our stewardship, to the fact that we are the gardeners. With Empire State Building Flashes (2005) Davis neatly illustrates our insensible relationship to our manufactured ecosystem. From the top of the Empire State Building, the flashes of tourist cameras go off, illuminating nothing. We look, and document, and end up seeing nothing. It is apropos, in this moment of so many figurative deaths—the death of literature, the death of art—that Davis should choose to see the grandeur of our voluntary euthanasia. In the lore of vampires and zombies, the temptation of death is one of eternal life. To give up who you are, your “soul,” is the only prerequisite to immortality. As humanity brinks on this transition, Davis looks through the eyes of our possible (inevitable?) future; even the undead see beauty.